An airplane crash is very serious business. There is a combination there of high speed, high altitude, and flammable fuel that makes any emergency response a large-scale action. That is why, after receiving a call that claimed that a plane had crashed on a Missouri farm, Greene County’s emergency vehicles turned out in force, with four ambulances, three deputies, a few highway patrol officers, a firetruck, and a few other assorted vehicles converging on the farm. The only problem was that it wasn’t a plane crash – it was just the caller’s neighbor washing his jet-engine-propelled semi truck. 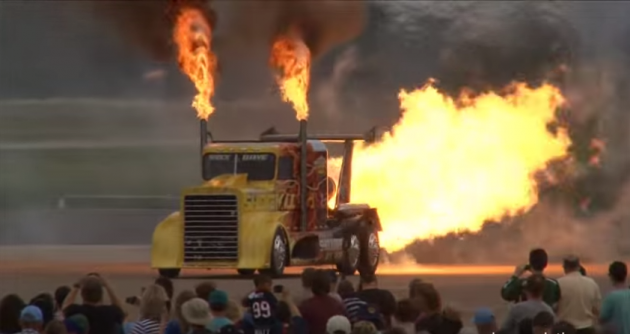 The truck is called the Shockwave, and it is owned by Springfield, Missouri, resident Neal Darnell, who (along with his son) takes it and two other jet-propelled (pickup) trucks to shows across the country, where they perform stunts like setting stacks of cars on fire and racing fighter planes. Related: Why is the Nissan GT-R Nismo Front-Wheel Drive? Part of the cleaning process of this behemoth involves firing up the engine, which creates some very loud noise and a huge cloud of white smoke (which his neighbors mistook for a plane crash). No citations were issued once emergency responders discovered the truth, since the callers honestly believed that there was a danger, so, after a friendly exchange with Darnell, the responders departed. “The cops thought it was cool,” Darnell said.